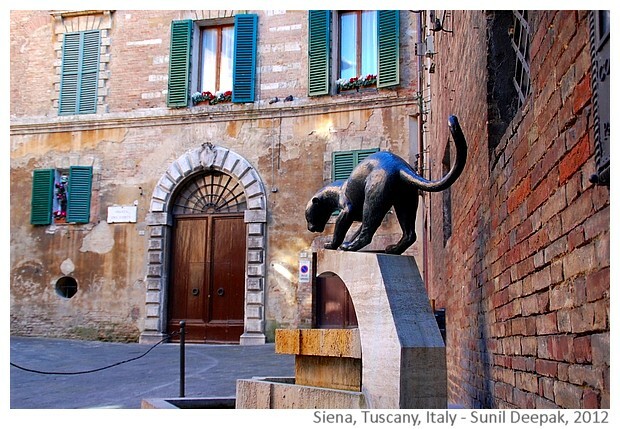 Siena is a tiny town in the Tuscany region of Italy. It has one of the most beautiful squares in the world - Piazza del campo, that holds the annual bare-back horse race called Palio. 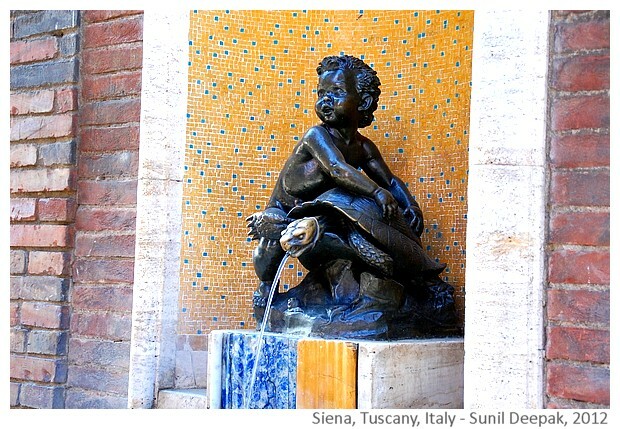 This post is about some of my favourite places in Siena. 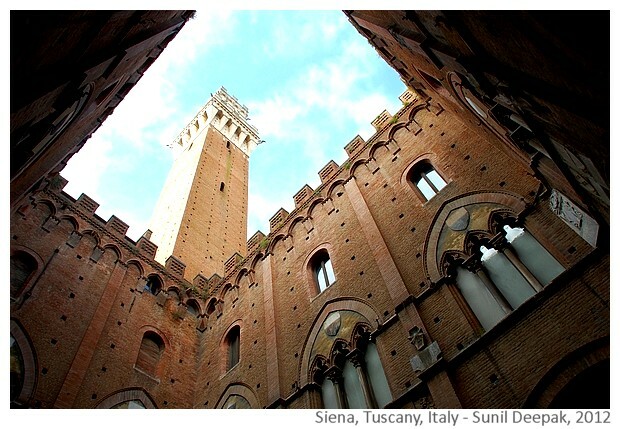 The 8 minutes long opening sequence of the 2008 James Bond film "Quantum of Solace" was shot in Siena. This sequence was pure adrenaline with shots of the Palio race and a thrilling chase over the dark brown roofs of medieval houses around the square. 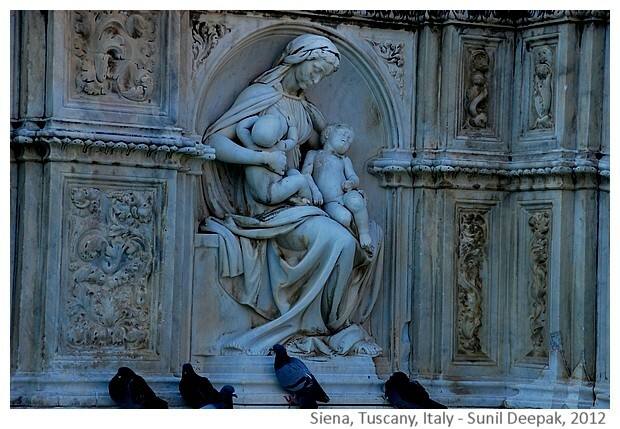 You can watch this sequence on Vimeo for a quick and exciting tour of the Siena city centre. Tuscany is considered to be one of the most beautiful areas in the world. 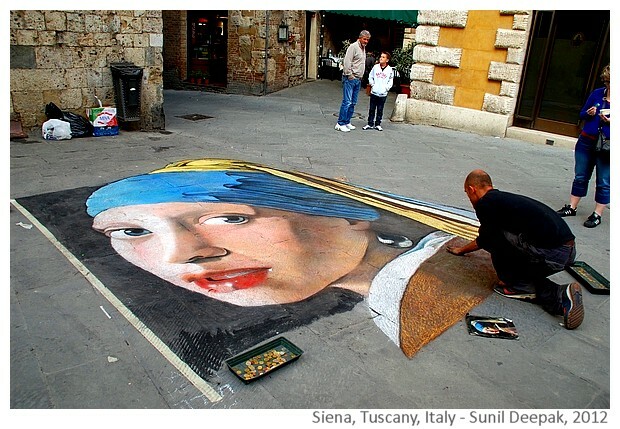 Famous painters and artists like Leonardo da Vinci, Michelangelo, Giotto and Cimabue were born in this region and started here their artistic carriers. Gentle hills of Tuscany with vineyards and cypress trees, with its painters, sculptors and other artists have been integral to the enlightment associated with the Renaissance period in Europe. 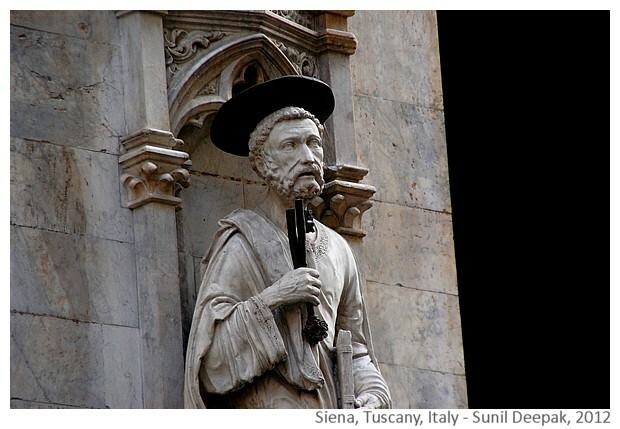 Thus, Tuscany was an essential part of "classical learning" in medieval Europe - artists, writers and nobility from all over Europe visited Tuscany as part of their education. Many of them wrote eloquent words about the beautiful light of Tuscany that can not be replicated any where else. Perhaps it is because of this tradition going back to the last 7-8 centuries, that even today most European heads of states have their holiday houses in Tuscany. 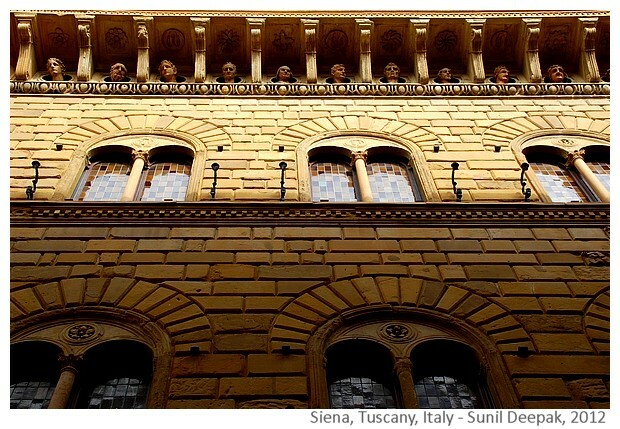 The centre of Florence, the capital of Tuscany, is considered as an open air museum. The region has many other famous cities including Pisa with the world famous Leaning Tower. 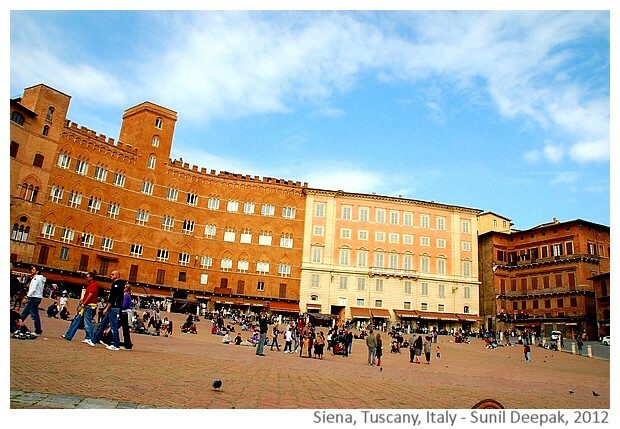 However, in my opinion, the wonderful central square of Siena is among the most beautiful places in the world and I love going there. 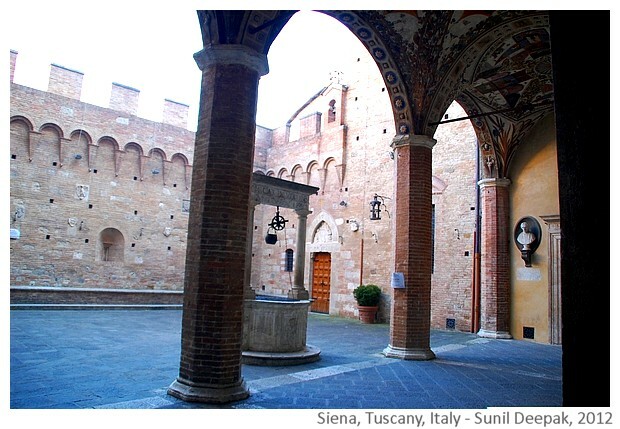 As a child I loved painting and had first heard of Siena as the name of a colour - "Burnt Sienna". 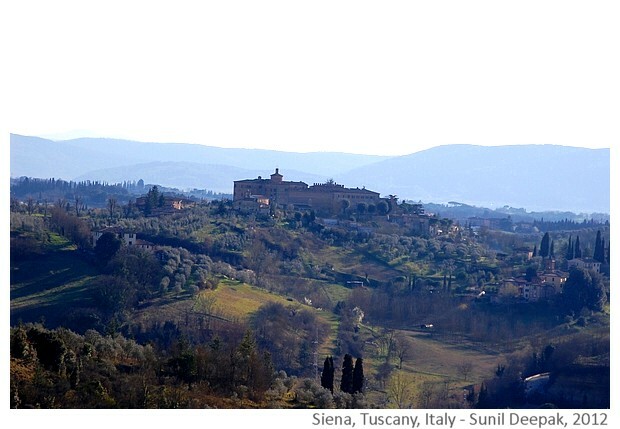 The land around Siena provides pigments for four colours that are called "the earth colours" - Sienna, Burnt Sienna, Ochre and Umber. All these colours have Iron Oxide mixed with Manganese Oxide. Ochre is more yellowish, Sienna is a darker yellow, Burnt Sienna is reddish-brown and finally Umber is darker brown. These earth colours were used by Siennese school of painting in the renaissance period. 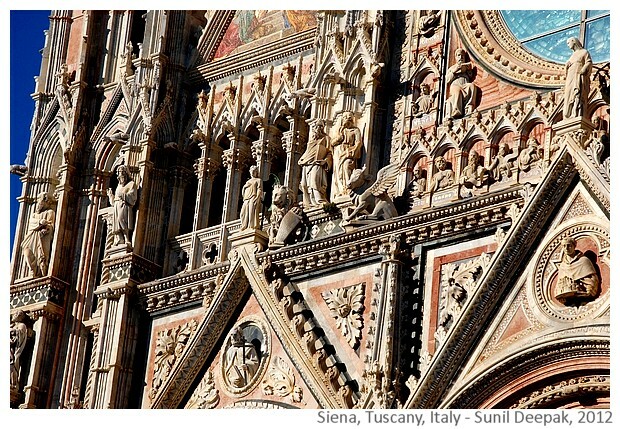 These are also very much visible in the colours of the houses in the narrow medieval streets and buildings of the Siena city centre. 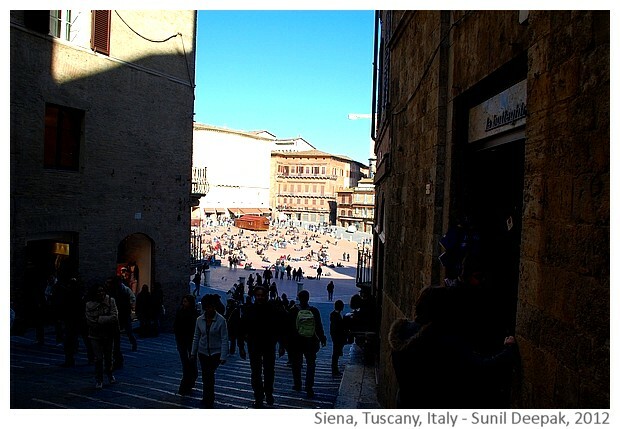 The next group of images is from Salimbeni square in Siena city centre and it shows the different shades of the earth colours. 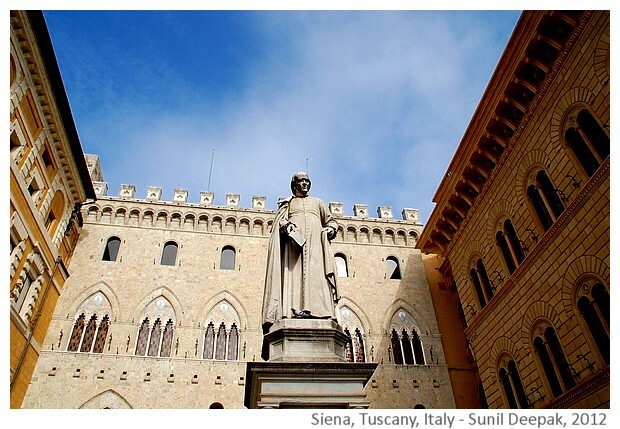 The statue of Sallustio Bandini, an Italian Jesuit priest and an economist, occupies the centre of this square - he was a fervent supporter of capitalism and free trade. Behind him is the building of the one of the first banks in the world. A corner building in the square attracted my attention - I thought that it was macabre with heads of people adorning the area just underneath its roof. 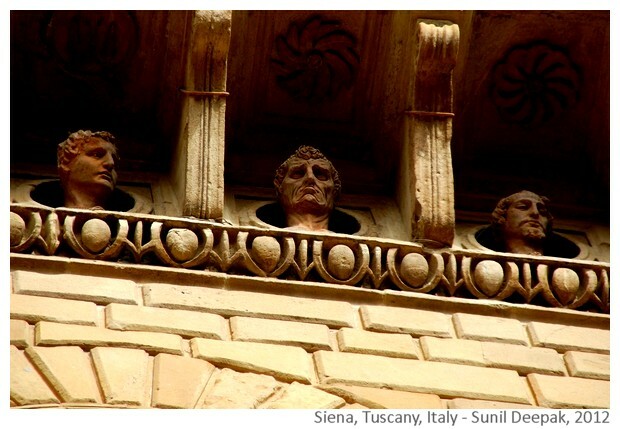 However, a closer look showed that these were not just heads but live persons peeking our from round windows, some of them with pronounced expressions. 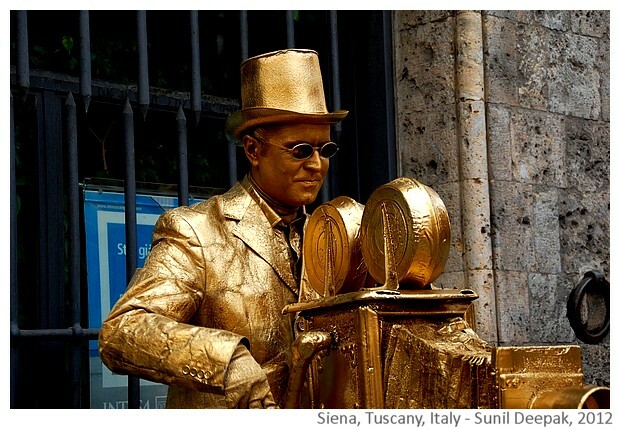 Close to Salimbeni square, usually you can find a man playing a "live statue", covered with gold colour, with a gold plated old-style camera shooting a film. I don't know his name but he has also appeared in many films. 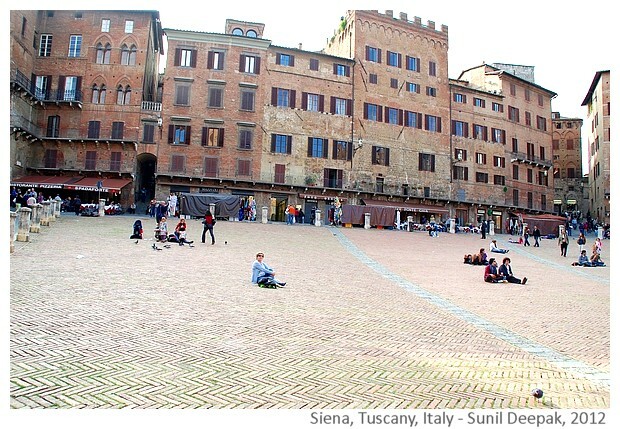 The central square of Siena called Camp Square (Piazza del Campo), is a huge semi-circular bowl or shell shaped space with gently sloping surface. 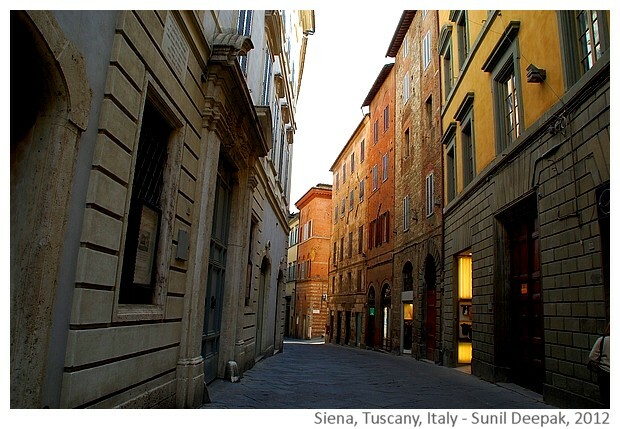 Narrow, winding medieval streets in the warm earth colours, coming in from different directions, when suddenly open in the large open space filled with light, it is a wonderful moment because it is so unexpected. At the bottom of the square you can see the thirteenth century Republican building with its "Manja tower". When it was built, this tower was the tallest structure in whole of Italy. In 14th century it was fitted with a mechanical clock. Copenhagen city hall in Denmark is inspired by this building. There is a small chapel next to it. Nine traingular spaces branch out from this building, going out towards the periphery of the square. The rest of the square is lined with beautiful noble family houses, all made in earth-coloured bricks. 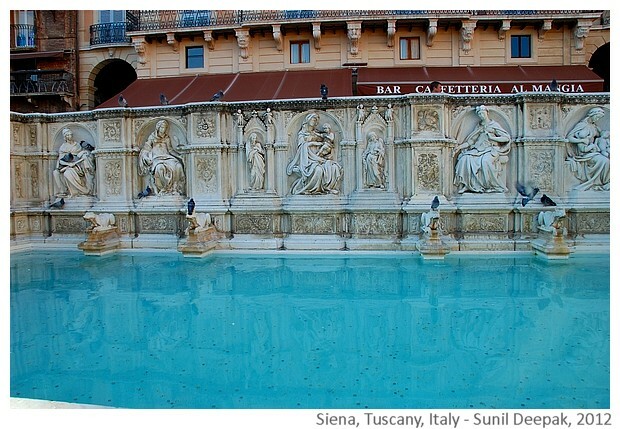 At the centre of the outer periphery is a fountain with beautiful sculptures and a rectangular water pond. The city is divided into 17 wards or contrade, each with its own symbol. Most houses of a a contrada carry its symbol near their entrance. Each year, 10 out of 17 contrade take part in the annual Palio race that is held on 2 July and 16 August. The images below show some houses from the Chiocciola (Snail), Pantera (Panther) and Tartuca (Tortoise) contrade with their symbols. Young horse jockeys have to sit bare-back on the horses during palio, thus often some of them fall down during the race. 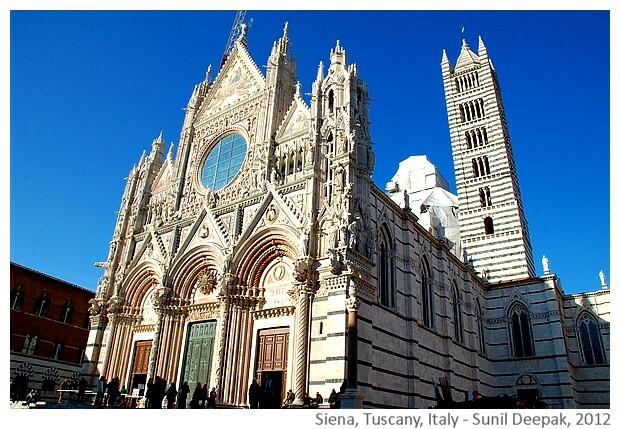 The cathedral of Sienna was built in the thirteenth century. 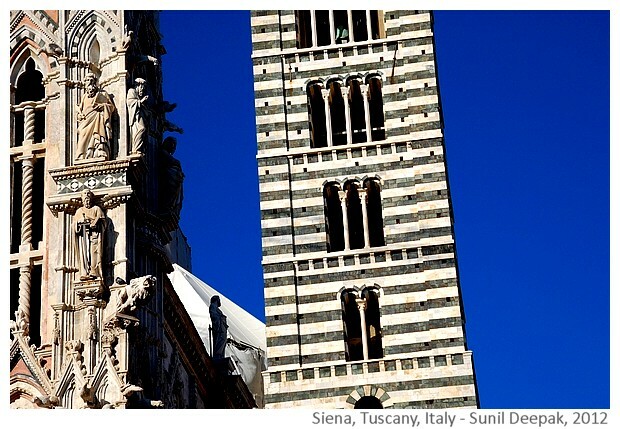 Its beautiful bell tower is in black and white, the two official colours of Siena. The facade of the cathedral with intricate sculptures is in Gothic style and the complexity of the sculpture and art work is one of the most intricate works in Europe. 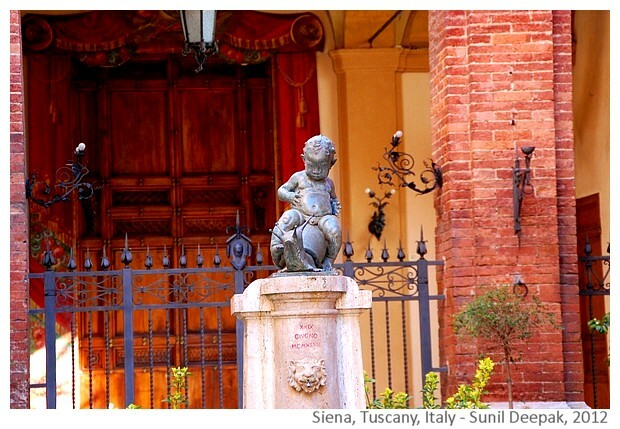 There are many other buildings and churches in Siena, full of beautiful sculptures and art works. If you have time you can also go out from the old medieval town to look at the surrounding countryside with its gentle hills, vineyards, cypress trees and beautiful buildings. I love Siena for the warm earth colours of its buildings and for the sensations of aesthetic pleasure in its central square. I can sit for hours in the central square, looking around and soaking the atmosphere of this magical place. Most tourists to Tuscany, limit themselves to visiting Florence and Pisa, and do not think of Siena except during the palio horse races. 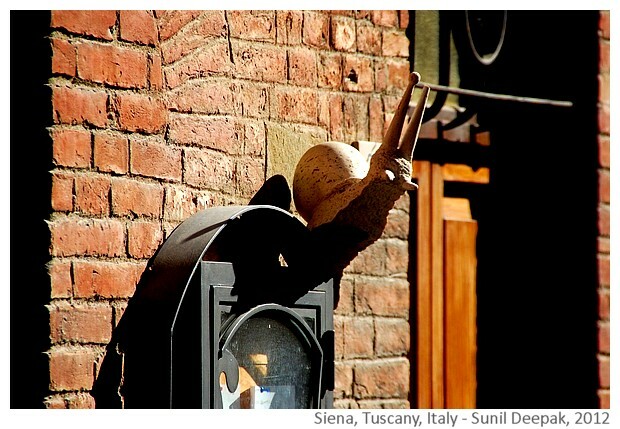 I think that it is a great pity and Siena also merits a visit. Siena is connected to Florence by hourly regional trains - these are slow trains and take about an hour and a half to reach to Siena, but cost little (less than 10 Euro for a journey). Mr . Sunil, you wrote good and you spent many time to explain there. Thank you so much. I have been one TİME near toscana also. Take care. A very detailed, informative and visually engaging post! The true essence of a city is in its city views and you captured them here brilliantly.